Tortoise rescue is not a very old practice, as people realized their importance in the ecosystem much later. Susan Tellem and Marshall Thompson have achieved success in this untouched area, starting their journey from the year 1990 rescuing turtles and founding American Tortoise Rescue www.tortoise.com. They have rescued more than 4,000 turtles rehoming most. â&#x20AC;˘ Human beings are intervening with the environment and the ecosystem in negative ways. As a result, many turtles and tortoises are on the verge of becoming extinct and many are now extinct. These two compassionate nature lovers have been relentlessly doing good work in this regard. 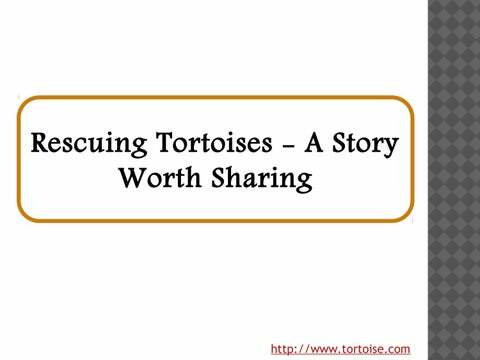 â&#x20AC;˘ At the time when they started, almost no one was rescuing tortoises or turtles. There were also no special rescue missions offered by the government. Not only has the picture changed, but there is also the special World Turtle DayÂŽ, may 23 rd, launched by American Tortoise Rescue in the year 2000.
â&#x20AC;˘ They are not only rescuing turtles but also striving to ban the live food markets around the world, which sell turtles and tortoises for food. â&#x20AC;˘ They have a dedicated sanctuary meant for deformed and unadoptable turtles and also turtles with special needs. â&#x20AC;˘ Marshall and Susan have also been working tirelessly to educate people about conserving tortoises and turtles through social media, media outreach and a lot more. â&#x20AC;˘ Red foot and desert tortoises are some of the tortoise breeds which have been successfully saved and rehomed by them.